FREE BodyFat caliper is included! THE FUTURE OF WEIGHT MANAGEMENT AND PERSONAL HEALTH IS NOW! Step on this clean, modern scale, and have the results instantly transmitted to your A&D Connect app. Its that simple. Theres no need to turn it on or remember to turn it off. 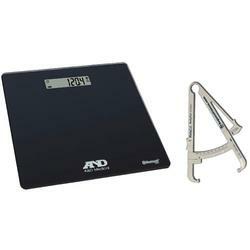 The Deluxe Connected Weight Scale has an industry leading capacity of 450 pounds thats precise within 0.2 pounds, an easy-to-read LCD display, and a long battery life. With step-on start technology, you get fast and accurate results youd expect from the leader in connected health management. And with wellness connected and the A&D connect app, you can now get connected right out-of-the-box. MetaCal BodyFat Calipers are the low cost accurate alternative. You will not find a less expensive body fat caliper. MetaCal was designed for and approved by American Hospital Supply over 30 years ago. Now, as times change, Sequoia Fitness is helping you change your body. MetaCal meets the Military Standard for Physical Readiness - can you? MetaCal BodyFat Calipers come packed with a user manual including unique instructions to measure body fat % as well as measurement charts for males and measurement charts for females, ages 18-65. MetaCal uses the 3-site Jackson Pollack body density equations for active adults to generate the results. A body fat % interpretation chart is available on line so you can see how you do relative to others. Note that we have found no documentation of formulas to justify making a single site caliper. If we could, we would.